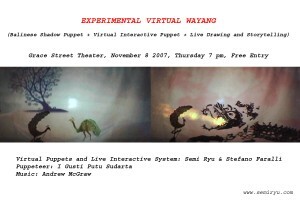 “Experimental Virtual Wayang” is a contemporary translation of the traditional Balinese (Indonesia) shadow puppet performance (“wayang kulit”), featuring virtual interactive puppets and a realtime background drawing system, bringing the sprit of live improvisation into storytelling. This project explores two ideas of shadow; traditional shadows casted by wayang puppets, and digital shadows, projected images of virtual puppets projected one same screen. The shadow master will be able to simultaneously manipulate traditional puppets as well as virtual puppets which have been fitted with infrared units which will be monitored by a motion and position detection system. This system then communicates with a three-dimensional computer graphics system which will project virtual puppets onto the same screen used to display the traditional wayang puppets. He will be able to change the look of the virtual puppet and to control its movements based upon his own voice. This project opens the interactive system to public, inviting people to draw background images, interacting with puppeteer and musician, during the performance. I Gusti Putu Sudarta is a renowned musician, composer, dancer and shadow master from the village of Bedulu in Bali, Indonesia. He is a permanent faculty member in the theater department at the Indonesian Institute of the Arts in Denpasar, Bali. Mr. Sudarta has been studying the Balinese perfoming arts since the age of six and participates in weekly ceremonial and secular performances. Since the mid 1980s he has participated in yearly international tours of Balinese traditional and experimental music and dance. He has taken part in numerous inter-cultural experimental theater and music collaborations including the Theft of Sita project in collaboration with the Australian composer Paul Grabowksy and theater director Nigel Jameson. Andrew Clay McGraw is an assistant professor of music and ethnomusicology at the University of Richmond. He has studied traditional and experimental music in Bali and Java during several years of residence in Indonesia. He has collaborated with several leading Indonesian composers and ensembles including I Wayan Sadra, I Made Subandi, I Wayan Yudane and the Cudamani ensemble. John Macdonald has been studying and performing Balinese and Javanese gamelan since the 1980s. He is a student of I Nyoman Suadin. Dialogue: Two Monks discuss their meditations: The Boddhisattva, having been born previously as a prince, is reborn as a peacock for committing sins in his previous lives. Mimpi: The Queen of the local kingdom sees the peacock in a dream and desires to own it. Pangkat: The King sends out hunters to capture the peacock. They fail. Sanghyang: In his grief and anger the King makes a plate on which he instructs his progeny to kill the peacock, saying its golden flesh will give them eternal life. Perang: Seven generations of royalty pursue the golden peacock, using mantra to transform themselves into magical beings. Dialogue: The captured peacock explains his true nature and history to the King, explaining that he ruled the land in a previous life. He proves this by showing the king a golden chariot he had buried below a lake. The king follows the peacock’s religious teachings and sets him free.